Assam Industrial Development Corporation Limited. 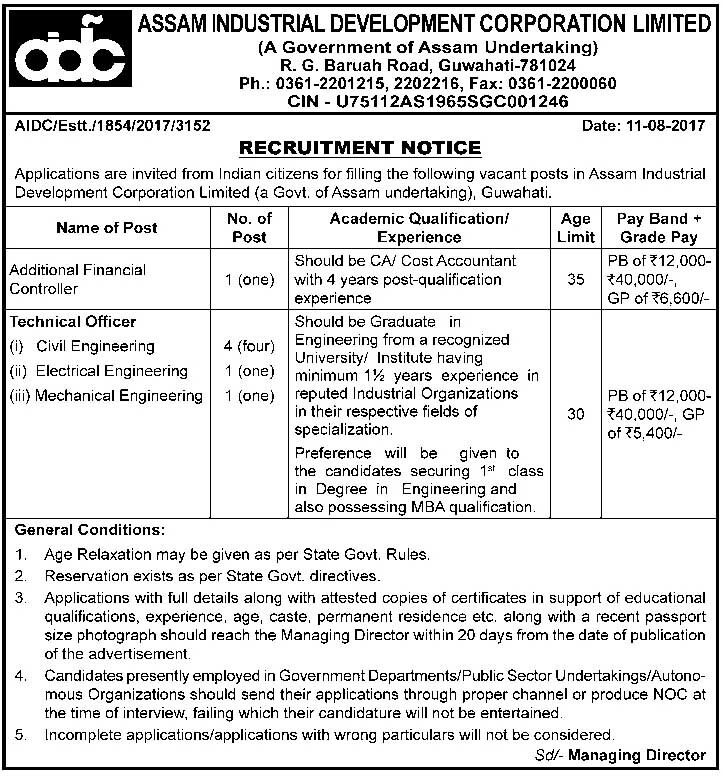 Applications are invited from Indian citizens for filling the following vacant posts in Assam Industrial Development Corporation Limited (a Govt of Assam undertaking), Guwahati. Educational Qualification: Should be CA/ Cost Accountant with 4 years post-qualification experience. Educational Qualification: Should be Graduate in Engineering from a recognized University/ Institute having minimum 1.5 years experience in reputed Industrial Organizations in their respective fields of specialization. Preference will be given to the candidates securing 1st class in Degree in Engineering and also possessing MBA qualification. How to apply: Applications with full details along with attested copies of certificates in support of educational qualifications, experience, age, caste, permanent residence etc. along with a recent passport size photograph should reach the Managing Director, Assam Industrial Development Corporation Limited, R. G. Baruah Road, Guwahati-781024 within 20 days from the date of publication of the advertisement (12-08-2017).